During Holy Week the Church remembers the final days of the Savior’s earthly life—His deeds and talks with His disciples, the institution of the Mystery of the Eucharist, Judas’s betrayal, the Lord’s captivity, His sufferings and humiliation, crucifixion, death, and burial. Holy and Great Monday. The cursing of the fig tree. Patriarchate of Pec. 14th c.
Holy and Great Monday. The cursing of the fig tree. Miniature from an Arabic Bible. 17th c.
Holy and Great Tuesday. Parable of the ten virgins. 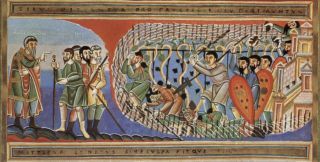 6th c. Miniature from a Bible of Rossano. Rosano Museum, Italy. Holy and Great Tuesday. Parable of the ten virgins. Modern Greek fresco. Holy and Great Tuesday. Parable of the husbandmen. Book miniature. 11th c.
Holy and Great Wednesday. Judas's betrayal. Duccio di Buoninsegna, 13th c.
Holy and Great Thursday. Washing the feet of the Apostles. Wall painting of the Panagia Assinou in Nikitari, Cyprus. 1105. Holy and Great Thursday. Washing the feet of the Apostles. Early 14th c. Fresco in Vatopedi Monastery, Mt. Athos. Holy and Great Thursday. The Lord explains the meaning of the washing of the Apostles' feet. Early 14th c. Fresco in Vatopedi Monastery, Mt. Athos. Holy and Great Thursday. The Mystical (Last) Supper. Early 14th c. Fresco in Vatopedi Monastery, Mt. Athos. Holy and Great Thursday. The Mystical (Last) Supper. Fresco in Vatopedi Monastery, Mt. Athos. Holy and Great Thursday. The Mystical (Last) Supper. Mosaic in the Cathedral of St. Mark, Venice. Holy and Great Thursday. The Apostles receiving Communion. Fresco in Stavronikita Monastery, Mt. Athos. Holy and Great Thursday. The Apostles receiving Communion. Fresco in the Cathedral of the Vladimir Icon of the Mother of God, Sretensky Monastery, Moscow. Holy and Great Thursday. The Apostles receiving Communion. 4th c. Miniature from the Rossano Gospels. Rossano Museum, Italy. Holy and Great Thursday. Prayer in Gethsemane. Mosaic from the Cathedral of St. Mark, Venice. Holy and Great Thursday. Prayer in Gethsemane. Early 14th c. Fresco in Vatopedi Monastery, Mt. Athos. Holy and Great Friday. Judas takes the soldiers to Christ. Armenian book miniature. 13th c.
Holy and Great Friday. Judas's kiss. Byzantine book miniature. Holy and GreatFriday. Judas's kiss. Early 14th c. Vatopedi Monastery, Mt. Athos. Holy and Great Friday. Judas's kiss. Cave church, Cappadocia. 11th c.
Holy and Great Friday. Christ being questioned by Annas. Fresco in Staro Nagoricno, Macedonia. 12th-14th c.
Holy and Great Friday. Christ being questioned by Caiaphas the high priest. Fresco in Staro Nagoricno, Macedonia. 12th-14th c.
Holy and GreatFriday. Christ at the judgment hall of Pilate. 6th c. Miniature from the Rossano Gospels. Rosano museum, Italy. Holy and Great Friday. Christ at the judgment hall of Pilate. 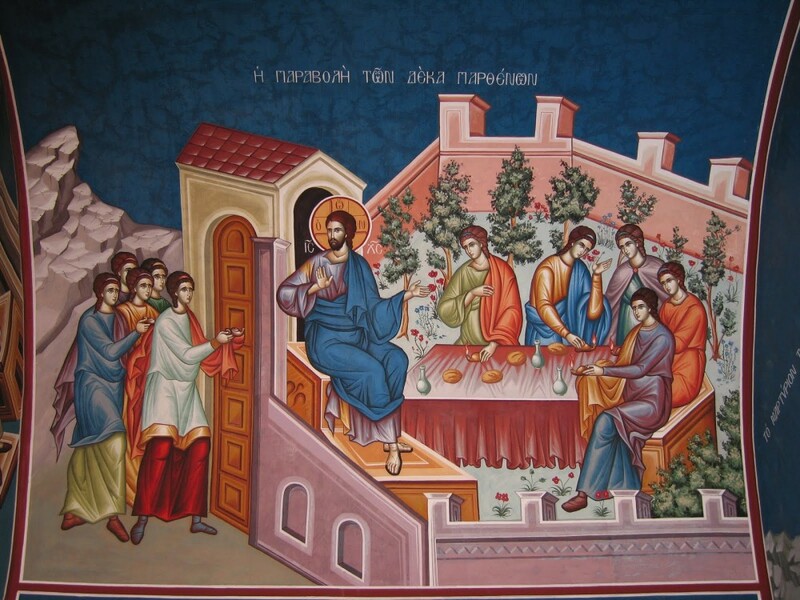 Fresco by Theophanes of Crete, Stavronikita Monastery, Mt. Athos. Holy and Great Friday. Christ before Herod. Fresco in Staro Nagoricno, Macedonia. 12th-14th c.
Holy and Great Friday. The Jews demand Christ's death: "Crucify Him!" 6th c. Miniature from the Rossano Gospels. Rosano museum, Italy. Holy and Great Friday. Christ's humiliation. Fresco in Staro Nagoricno, Macedonia. 12th-14th c.
Holy and Great Friday. The death of Judas. Church of St. Lazarus, France. 7th c.
Holy and Great Friday. The Savior's way of the Cross. Elephant tusk. British Museum. 420-430 AD. Holy and Great Friday. Simon the Cyrenean helps the Lord carry His cross. Fresco in Cyprus. Holy and Great Friday. The Lord walks to His suffering. Fresco in Stavronikita Monastery, Mt. Athos. Holy and Great Friday. Ascending the Cross. Early 14th c. Vatopedia Monastery, Mt. Athos. Holy and Great Friday. Christ nailed to the Cross. Fresco in Dionysiou Monastery, Mt. Athos. Holy and Great Friday. The crucifixion of Christ, and the death of Judas. Ivory. British Museum. 420-430 AD. Holy and Great Friday. The Crucifixion. 8th c. Mt. Sinai. Holy and Great Friday. The Crucifixion. Cave church, Cappadocia. 11th c.
Holy and Great Friday. The Crucifixion. Fresco in the Church of St. Nicholas in Prilepe, Macadonia. 11th-13th c.
Holy and Great Friday. The Crucifixion. Mosaic in the Monastery of Hosias Lukas. Holy and Great Friday. Christ's death. Fresco in Vysoki Decani Monastery, Serbia. 14th c.
Holy and Great Friday. Taking Christ down from the Cross. Amenian book miniature. 8th c.
Holy and Great Friday. Taking Christ down from the Cross. Fresco in Dionysiou Monastery, Mt. Athos. Circa 16th c.
Holy and Great Friday. Taking Christ down from the Cross. Book miniature. Holy and Great Friday. Lamentations. Fresco in Dionysiou Monastery, Mt. Athos. Circa 16th c.
Holy and GreatFriday. Lamentations. Fresco in Gracanica Monastery. Holy and Great Friday. Lamentations. Fresco in the monastery in Nerezi, Macedonia. 7th c.
Holy and Great Friday. Placing Christ in the tomb. Mosaic in the Church of the Resurection of Christ in Jerusalem. Holy and Great Friday. Placing Christ in the tomb. Fresco in Cyprus. Holy and Great Saturday Saturday. The back of a double-sided Hodigitria Icon with the image of the Mother of God. The Museum of Archaeology in Kastoria, Greece. Holy and Great Saturday. Christ surrounded by angelic forces. A Christ shroud of the Monastery of the Transfiguration of the Lord, Meteora, Greece. 14th century. The inclusion of Duccio, a Roman Catholic of the late 13th and early 14th centuries, is odd. Здесь Вы можете оставить свой комментарий к данной статье. Все комментарии будут прочитаны редакцией портала Православие.Ru.